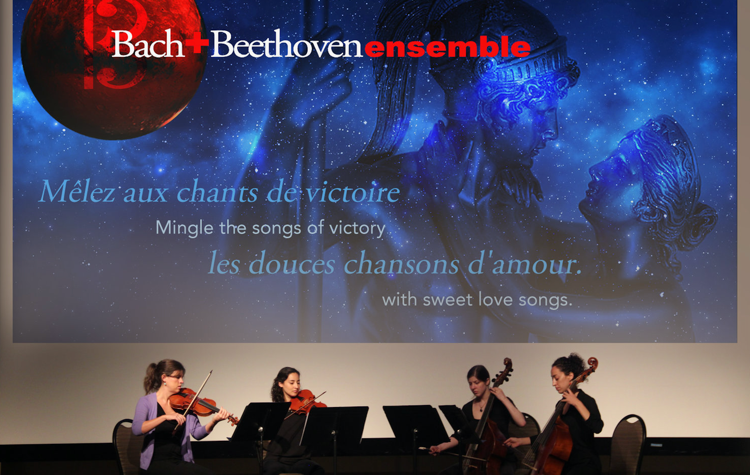 Members of the Bach and Beethoven Ensemble performing in the “Humanities in Spaaaace!’ series. bars, booze, and Gaelic beavers. 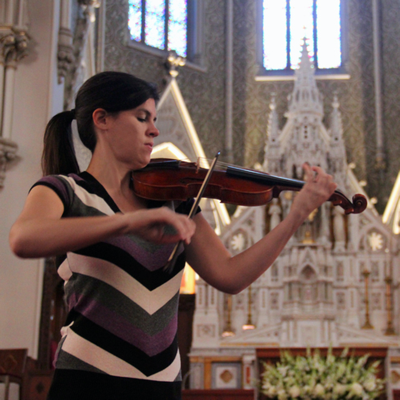 Yet that kind of folksy, irreverent approach typifies Chicago’s Bach and Beethoven Ensemble and helps set it apart not just from its peers in Chicago but from just about all other such groups in the country. Put simply, the budding group is doing everything it can to attract audiences who know little about classical music and maybe even less about early music. The lighthearted marketing text introduces an e-mail promotion for the group’s June 14-16 series, “Gaelic Summer,” a three-day pub crawl that will include live-band karaoke, Highland dancers, and open-mic storytelling. Anchoring everything will be period-instrument performances of 17th- and 18th-century drinking and dancing songs from Scotland, Ireland, England, and Wales. The saloon series epitomizes the ensemble’s insistence on accessibility in everything it does. To that end, it puts a premium on alternative venues, cross-genre music-making, and imaginative collaborations — in this case with such groups as the Chicago Scots and Chicago Tafia Welsh Society. “I find BBE’s approach refreshing, not only in its unconventional, appealing programming but also in its creative outreach via social media, involving ‘mascots,’ humor, clever branding and ambitious risk-taking,” Chicago native Laurence Libin said via e-mail. The holder of several titles, including curator emeritus of musical instruments at New York’s Metropolitan Museum of Art, he met baroque violinist and artistic director Brandi Berry at a musical event in Wisconsin some years ago and became a supporter and member of BBE’s advisory board. Berry co-founded BBE in 2009 with baroque oboist Curtis Foster, but it had no formal structure. It was essentially just a loose group of musicians who wanted play the music of Bach and other composers on period instruments, and it performed sporadically whenever it could secure an engagement. But after Foster moved to Seattle several years later, Berry began thinking about converting the ensemble into something more ambitious. In 2014, she reconnected with Aláan, whom she had met when they were students at music schools in Texas. They shared a vision for a group that would break from the status quo. He agreed to come on as executive director, and Berry took the role of artistic director. By 2015, they had a six-member board and official non-profit status with the Internal Revenue Service, and the group in its present form was launched. More than just musicians, Aláan and Berry are entrepreneurs who didn’t want their group to be just another period-instrument ensemble presenting Bach’s Brandenburg concertos in a church. They sought to develop a flexible, responsive, project-oriented group that would redefine what such an organization could be. “We don’t want museum, stodgy, stale, outdated,” Berry said. The ensemble is particularly targeting millennials — young people born from 1982 through 2004, which includes Aláan and Berry, both 33 — and the slightly older members of Generation X. So far at least, their efforts seem to be paying off. 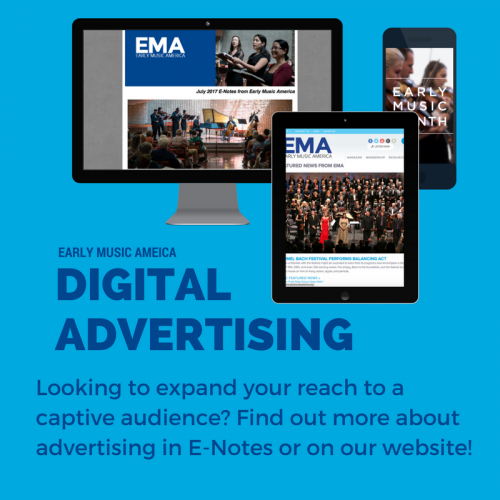 While BBE has not done thorough studies of their audiences, the two ensemble leaders are confident that a large percentage are not typical early-music devotees. The ensemble’s 2016 production of Allan Ramsay’s ‘The Good Shepherd’ reportedly was the first in the U.S. since 1792. The ensemble’s biggest and most visible project to date was its presentation last year of Allan Ramsay’s The Gentle Shepherd in a new arrangement created by Berry. Considered to be the first Scottish opera, it was published in 1725 and had last been performed in the United States in 1792. This unknown work checked all the boxes for the ensemble. Because the folk-infused piece fused traditional Scottish fiddling with the Italian Baroque style, it gave the production a cross-genre flavor and allowed BBE to collaborate with Chicago’s Thistle and Heather Highland Dancers. In addition, because the opera was written in kind of songspiel style with spoken dialogue and sung arias, the production incorporated eight actors from Chicago’s rich theatrical scene along with six singers and five baroque instrumentalists. Adding yet another non-traditional flavor to this production, the ensemble presented it both at Theater Wit, an intimate, storefront venue, and at the Old Town School of Folk Music in Szold Hall, which is typically home to folk and acoustic musicians. Both performances sold out, with 104 people at the former and 150 at the latter. 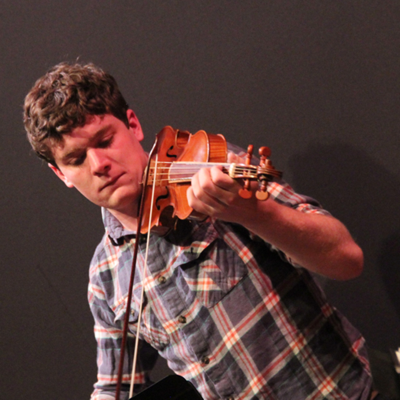 Violinist Tim Macdonald, who specializes in Scottish-Baroque music, is a regular BBE artist. 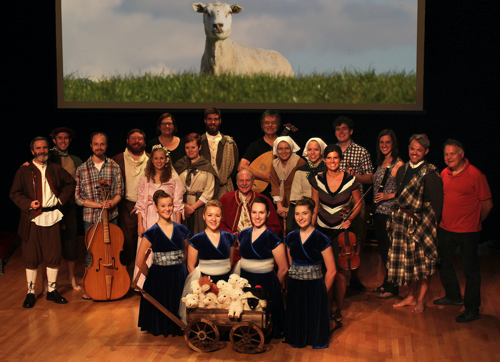 The ensemble raised $22,000 for The Gentle Shepherd, with $6,000 coming through the 3Arts Projects crowd-funding platform. Berry received access to such support because she was one of 10 winners in 2014 of the 3Arts Awards, which are given annually in Chicago to significant women, artists of color and artists with disabilities. Another major undertaking has been its participation in “Humanities in Spaaaace,” a three-part series hosted by the DePaul Humanities Center for which it serves as what director H. Peter Steeves calls the “house band.” The final installment on April 11, focusing on the moon, will include talks by two scientists, an Abenaki traditional storyteller, and the BBE in performances of Beethoven’s “Moonlight” Sonata, an aria from Haydn’s opera The World of the Moon, and Bellini’s arietta “Vaga luna, che inargenti” (Beautiful moon, dappling with silver). Steeves met Aláan, who administers the University of Illinois at Chicago’s Summer Institute on Sustainability and Energy, when the latter came to DePaul to give a lecture about philosophy and sustainability. Steeves became intrigued with how the ensemble might contribute to some of the humanities center’s 20 or so annual events, which always include an artistic component. He likes the group’s ingenuity and “Let’s put on a show” spirit. “I can give them any sort of crazy idea and they come back to me with a bunch of possible ways to interpret that and ways in which they might be involved,” he said. The group is already scheduled to return in November to take part in the Humanities Center’s program marking the 100th anniversary of the Russian Revolution. Steeves also hopes BBE will contribute to a June 1 celebration of the 50th anniversary of the release of Beatles’ album, “Sgt. Pepper’s Lonely Hearts Club Band.” “I’d love to hear ‘Lucy in the Sky with Diamonds’ played on traditional string instruments from 300 years ago. That would be fantastic,” he said. 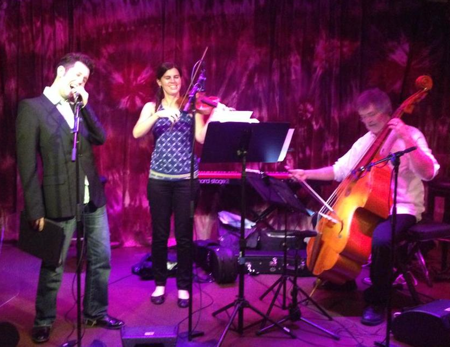 From Oct. 20-22, the BBE will present its inaugural presentation of “Chicago Stories,” for which it has invited a quartet of composers to take part. Aláan and Berry have asked each composer to pick an ethnic or geographic community in the city and write two period-instruments works about it with the help of collaborative partners within the group. Of course, the ensemble’s experimental vision wouldn’t amount to much if the organization was not delivering a high level of musicianship. According to Ward, that’s exactly what it does, bringing abundant energy to its performances and an understanding of whatever specific style or period of music it is taking on. The group has a roster of mostly Chicago-area musicians that shrinks or expands depending on the needs of each project. It has eight regulars that participate in many of its offerings, such as Leighann Daihl, a historical flutist, and draws on others as needed, including violinist Tim Macdonald, a Scottish baroque specialist, who took part in The Gentle Shepherd. The annual budget for the ensemble has grown to $60,000 this year, and it recently completed a five-year plan, as it works toward greater financial stability and organizational sustainability. A big part of the future is finding a way for Aláan and Berry to become part-time and ultimately full-time employees. 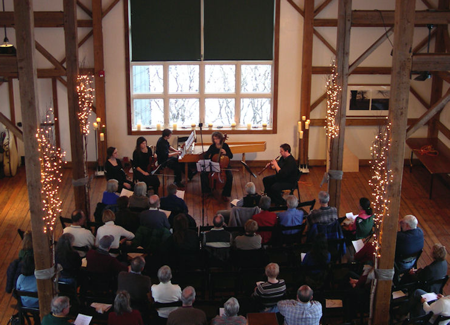 BBE musicians performing in the Byron Colby Barn Early Music Series in Grayslake, IL. At the moment, both are largely volunteer, receiving small stipends connected to BBE’s projects, with their work for the ensemble coming on top of everything else that they do. “It’s a lot of love after hours,” Aláan said. 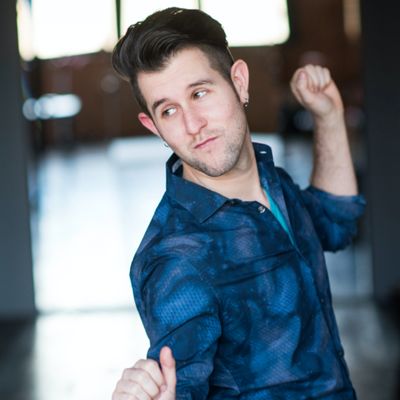 Berry has a demanding performing schedule as a violinist and teaches at DePaul and the Old Town School of Folk Music; Aláan works part-time at Holy Name Cathedral as an assistant choral conductor, in addition to his full-time job at UIC. What is beginning to come into focus is the group’s performance line-up. The two leaders expect “Chicago Stories” to become a regular event along with the group’s summer pub-crawl, with future editions devoted to Spanish or Cajun drinking songs. And it wants to do more projects like The Gentle Shepherd. The next in development is a zarzuela (a Spanish form of musical comedy) based on a 17th-century play inspired by The Little Gypsy Girl, a novella by Cervantes published in 1613. At the same time, Aláan and Berry are determined to leave room in the schedule for the unexpected. The BBE is still very much in the formative stages, but it has already managed to carve out a unique niche for itself on Chicago’s period-instrument scene. Its inventive undertakings suggest an approach that might have resonance far beyond that city’s borders. Kyle MacMillan served as music critic for the Denver Post from 2000 through 2011. He currently freelances in Chicago, writing for Chamber Music and Listen magazines and such other publications and websites as the Chicago Sun-Times and Classical Voice North America. As Pants The Hart, As Ends The Month!